The 10 Best Comedy Spots in Florida! In need of a laugh-until-you-cry moment or a good belly laugh? Then head to any of the legendary comedy spots in Florida for a night full of chuckles and witty jokes. From local talent to nationally-renowned comedians, these comedy venues put on some of the most hilarious shows we’ve seen. SAK’s unique improvisation based comedy show is interactive and will have the whole crowd giggling. Known as the starting place for many writers, actors and producers on nationally successful shows like “Saturday Night Live,” “The Office” and others, you’ll definitely enjoy their shows and events. 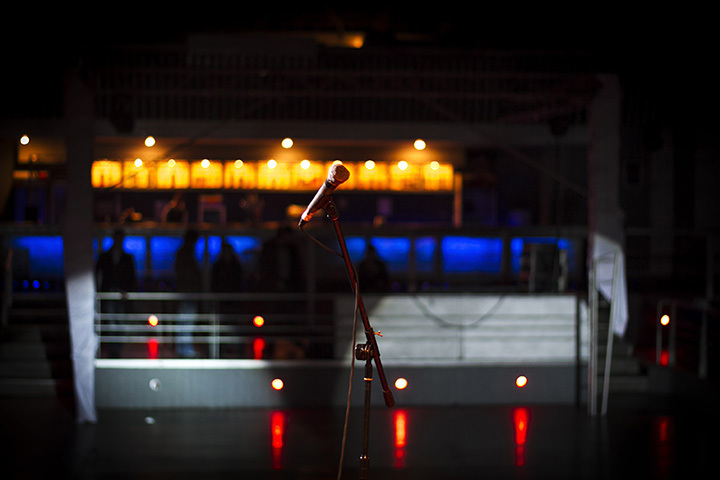 Go to a show at the lab itself or hire their comedians to liven up a birthday party or celebration! With six locations throughout Florida, Bonkerz has been making Floridians laugh hysterically since they first came to this state in 1987. With Christian comedians, hypnotists, college comics and more everyone will find a great show for their personal taste. Every weekend visitors and Cocoa locals head over to Gregory’s for their hilarious adults only comedy shows. Featured comedians have appeared on HBO, Comedy Central, Showtime and even more! Our favorite Tampa comedy house hosts some of the funniest comics in the entire state. Enjoy some drinks and munchies while chuckling and enjoying a fun night out on the town with friends or a date. This comedy club and dinner theatre is a spot where you’ll find some of the biggest names in comedy performing. With shows every night of the week you will surely find a hilarious show that will fit into your schedule. Come hungry, thirsty and ready to laugh! Each week you’ll find up-and-comers, notable celebrities and everything in between at the Comedy Club of Jacksonville in, you guessed it, Jacksonville. With a buffet selection for groups and delicious menu options for smaller parties, this is a great place to have a bite while laughing your you-know-what off! If you enjoy interactive sketch and improv comedy, Just The Funny in Miami is the place to go! What makes this club so special is how they base their show off of what the audience suggests. This award-winning theater offers shows and classes to those interested in learning more about finding their funny. Established in Sarasota in 1988, this comedy theatre is devoted to the art of stand-up comedy. They too offer a program for potential new comics, The Adult Comedy Boot Camp. Mingle in The Green Room before or after a show to enjoy tasty drinks and eats. Priding themselves for being “the nuttiest place in town,” this St. Pete Beach club is the place to go if you’re looking for a laugh after a day at the beach. Unwind here with friends or family and enjoy one of their local or nationally known acts! The performers at The Comedy Zone in Jacksonville will have you cackling from the start of the opening act. Each show is unique and you’re likely to never see the same thing twice! Check their calendar to find the best show that fits you. View more Florida Comedy Clubs.